Let The Inn at Vaucluse Spring make your wedding day unforgettable. Say “I do” amongst rustling leaves and the melodious sound of running water. From the venue to the guest accommodations, we will make sure you have the wedding of your dreams. Our wedding venue in Virginia has a history of creating lasting memories. The Inn at Vaucluse Spring gives the happy couple the option of both an indoor or outdoor ceremony and reception. Our historic Manor House, gracefully landscaped grounds, and large limestone spring provide an enchanting setting for your ceremony. The weather in Stephens City, VA is beautiful year round and is conveniently located near Winchester. Download our free Vacation Guide if you’re interested in finding out what to do in the area! 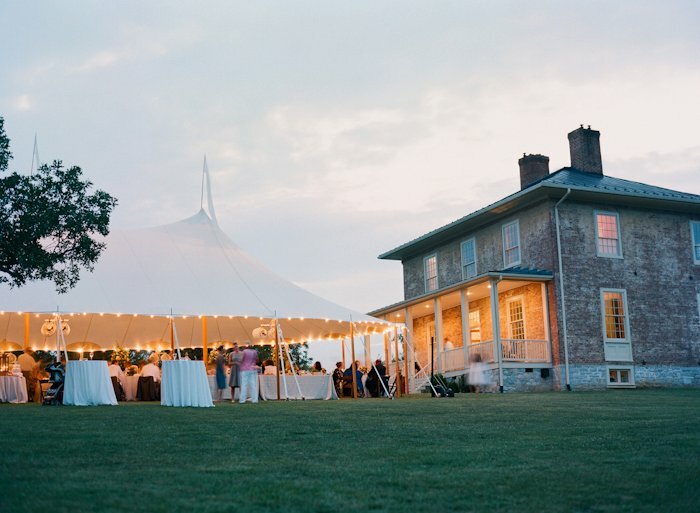 Our wedding venue in Virginia can also be the perfect spot for a destination wedding. Only 90 minutes from Washington, DC, and only 75 minutes from Dulles International Airport, the Inn is ideally located for easy access by your guests—just 3 miles off Interstate 81 and 4 miles off Interstate 66. Whether you’re searching for wedding venues in the Shenandoah Valley or a place to host your next family gathering, we can help make your event perfect and memorable. Contact us to learn more about event gatherings or hosting your wedding at The Inn at Vaucluse Spring. Not many wedding venues in Northern Virginia give you exclusive use of the property for the weekend. When you choose The Inn at Vaucluse Spring, the entire property is yours. We offer luxurious accommodations for your wedding party and guests. The beautiful main house along with the cottages placed throughout the grounds offer a home away from home during your wedding or group gathering. With 15 guest rooms, sleeping up to 32 guests, the Inn can accommodate immediate family and provide a relaxed setting for becoming better acquainted. May We Suggest Our Honeymoon Cottage? The guest accommodations are taken care of, and so is your honeymoon cottage. The Mill House Studio is an intimate, private cottage exquisitely placed on the edge of the Vaucluse Spring. Enjoy the double Jacuzzi tub, fireplace, and private patio that overlooks the spring. Have a glass of celebratory champagne while taking in the picturesque view, then let the sound of water rushing through the old millrace lull you to sleep at night. It’s sure to make your honeymoon one for the books! There is no need to leave the property after the ceremony to continue into your reception. There is the option of indoor dining available for up to 40 people. We allow catering of your choice, and are more than willing to give you recommendations and provide referrals of the best caterers in the area! For guests staying with us, we serve a delicious breakfast each morning. Indulge in homemade baked bread, fresh fruits, and hearty entrées before you get ready for the big day! Rental of all 15 guest rooms for two nights is required. Room rates are based on double occupancy. Two rooms can each sleep one additional person in a twin daybed. There is a $30 per person per day charge for a third person in the room. The Inn can accommodate wedding ceremonies and indoor dining for up to 40 persons. There is a myriad of beautiful options for an outdoor ceremony and both the Manor House and Chumley Homeplace have suitable common rooms for indoor ceremonies. Both houses have a first-floor powder room. If you need more information or we can help in any way, please don’t hesitate to let us know.